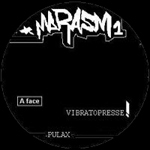 first vinyl of marasm. features complex analogue breakbeats (electronic chaos hiphop on 33, handmade jungle on 45), lot's of filters and a certain free-style atmosphere (both speeds). didn't find out if it's a 45 or 33 rpm vinyl, sounds deliberated and nice weird on both.